If you want to enjoy the sun without getting sunburned, then you need to choose the best sunblock available. You will want to choose a sunscreen that offers broad spectrum protection against UVA and UVB rays. The SPF on a suntan lotion stands for Sun Protection Factor and only applies to UVB rays. It is a multiplier that measures how much longer you can stay in the sun without burning, so if you can tolerate 10 minutes in the sun before burning, then an SPF 50 will provide you with 500 minutes of protection. Some of the factors that determined our ratings included actual protection level, how smooth and light the cream goes on, the active ingredients, whether the product leaves stains on fabric, and cost. Below you will find our top 10 best sunscreens reviewed. Our number one choice is Eltamd UV Clear SPF 46 Facial Sunscreen which just happens to also be the best selling skin protection product on Amazon that all users seem to love. It is perfect for those of you with sensitive, oily, or acne-prone skin. It feels very light and goes on smooth, plus you can wear it alone or under your makeup. The only downside is the price. It costs around $19 for a 1.7 oz bottle which is more expensive than average. 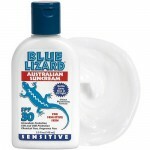 As we researched sunblocks, one name seemed to show up on everyone’s best list – that is the Blue Lizard Australian Sensitive SPF 30 Sunscreen, which is why it ranks number 2 on our list. This lotion is chemical and fragrance free and uses titanium dioxide and zinc oxide as active ingredients so it will not irritate your skin. It is a little bit thick, so you just need to rub it in more. A 5 oz bottle will set you back about $10.50 so it is not the cheapest suntan lotion, but far from the most expensive too. The Skinceuticals Ultimate UV Defense SPF 30 Suncreen is another cream meant for you face and will cost about $33.50 for a 3 oz tube. It is just a little bit thicker feeling than the Eltamd facial product which is why it scores lower. However, it still offers great broad spectrum protection and can also be applied under your makeup. It is also PABA-free, fragrance-free and oil-free. Next on our list is L’Oreal Sublime Sun Sheer Protect tanning oil spray which sells for $8 for a 5 oz spray bottle. This stuff is super easy to apply – just spritz on then rub in slightly. It gives your skin a soft sheen without feeling oily or greasy. 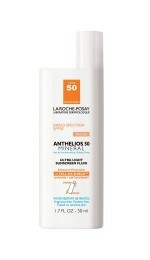 It also has great UVA and UVB protection with an SPF of 50+. The only problem is that with a spray sometimes your coverage can be spotty, and it can come off easier in sport activities. If you are just sun-bathing, then this is near perfect all-over tanning oil. 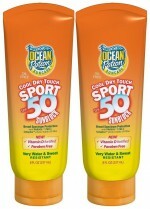 The Cool Dry Touch Sport Sunblock is our choice for the best sport sunscreen. It is very water and sweat resistant, so if you like to stay active in the sun then this product is great for you. Also it has a touch of menthol in the lotion that makes your skin actually feel cooler. It costs $12.75 for an 8 oz tube. One negative is that is does feel a little bit thicker than some creams. 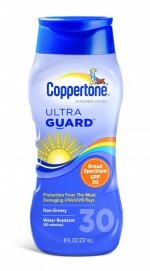 This Coppertone UltraGuard sunscreen lotion sells for about $7.50 for an 8 oz tube which makes it a good value choice. This product is another one that is great for heavy-duty protection for a day of outdoor sports. It has broad spectrum protection against UVA and UVB rays and the non-greasy formula is water resistant. Users should note that this lotion does have a slight fragrance to it. This facial sunscreen is the most expensive on our list at around $27 for a 1.7 oz tube. It is also the only one on our list that comes tinted, meaning it will give your skin an instant, natural glow. It provides excellent protection, the texture feels light, and it works well on sensitive skin. However, that tint can stain your clothes so use it carefully. 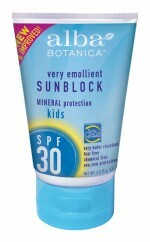 The Alba Botanica Natural Very Emollient Sunblock is our choice for best kids sunscreen. You can get a 2 pack for $18.50 with each tube containing 4 oz of lotion. This all natural product is chemical free, tear free, and very water resistant which all adds up to a great product for kids. 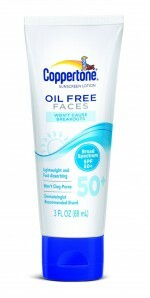 The Coppertone Oil Free Faces is our choice for best budget face sunscreen lotion. It comes in a 3 oz tube for about $7 which is much cheaper than other facial sunblocks on this list. It offers solid protection, but will not clog your pores or cause breakouts. It is fragrance-free, oil-free, and hypoallergenic. 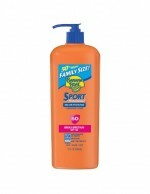 If you are looking for a bigger sized lotion to protect the whole family while on vacation then the Banana Boat Sport SPF 50 Family Size bottle is perfect for you. This 12 oz pump bottle costs about $10, which is the cheapest on our list per ounce. The pump action makes it really easy to apply quickly. Plus it offers broad spectrum protection and is long-lasting due to being very water and sweat resistant. Unfortunately it is a bit thick and needs to be rubbed in good to avoid leaving a slight white film on your skin.